Moving into a new home can be an exciting time, but don’t forget to investigate before making the plunge. Preventing pests is always on my mind when thinking about my surroundings. That came in handy when my husband and I were preparing to buy a new home. I had fallen in love with one house in particular–a beautiful, white and blue home built in ’84. It had a gorgeous porch and very unique floor layout with four levels. I was sold from the moment I saw the picture online. Unfortunately, once we stepped inside, I realized I wasn’t alone in my admiration. As someone who can smell a mouse a mile away, I knew a colony of them had made it their home first. One of the first things I noticed was the smell of something foul, something that I know all too well–the smell of a dead mouse. The next thing that caught my attention was the little black droppings that appeared to be speckles in the carpet. As someone who works in pest prevention, I knew I had the tools to make that house my own. But ultimately we decided it just wasn’t worth the effort. They’d done a great deal of damage and we knew we could do better. How did I know that there were mice hiding in those walls? That’s what I’m going to share with you so that you’ll have your own checklist before you sign on the dotted line. Rubbings/markings. When stepping into a house, look for rub marks along the walls and carpet. Mice and rats use a pathway along the wall and will leave behind grease marks and wear on the carpet, along with a trail of feces. Feces/urine. When it comes to rodent excrement, most of the time there will be no odor. However, if the rodents have had a run of the house for a significant amount of time, with little air flow, the feces will start to pile up and leave the house with a smell. Look for feces on the floor or carpet, especially along paths by the wall, and window sills and counters. The first clue will be little black spots, about the size of a grain of rice. If you are able to, move the stove, fridge, or dressers and look behind them. If there are rodents in the house, you WILL find feces behind and under appliances and furniture. Chew holes. Chew holes can be found anywhere that a rodent has made their own entrance and exit. Look in vents, ridge caps, soffits and siding for chew holes. The dryer vent is the ideal place for a mouse or rat to chew their way in. Because of the warmth that is coming from the vent, rats or mice will seek refuge, especially in the winter months. There is nothing like the smell of a dead rodent and once you have experienced it, you will never forget it. It is very similar to that of roadkill, but locked up in a house with little to no air flow. If you walk into a house and the first thing that you can smell is a dead rat–be cautious! That usually means that there are numerous mice living, and dying, in the area and there is more than likely a rodent infestation. Stored boxes. Take a look around. Do the current owners have lots of things packed up in cardboard boxes? Rodents love boxes because they are easy to chew into. They provide a great shelter, and the shards of cardboard make for great bedding. Not to mention the awesome goodies that they may find inside, like clothes, blankets, or best of all, family heirlooms. Also, be aware of boxes that are sitting outside. Once someone brings that box inside, they’ve made their way in. Food left out. Have you noticed any food that the current owner has left out? Rats and mice love a nice buffet of their favorites — and surprisingly, cheese is not high on their list. The best treats for a mouse are pet food and grains, cereals, bread and crackers. And hey, those McDonald’s bags are also a real delight. Mess left behind. Rodents love clutter because it provides them with some great hiding places and all sorts of found treasures. Also, dust and dirt attract mice and rats, which just so happens to go hand in hand with clutter. 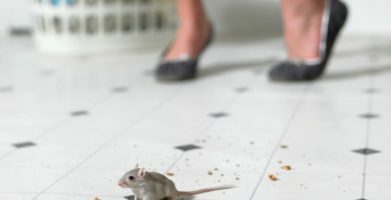 Mice rely mostly on their sense of smell as their eye sight is poor, so leaving garbage in the can, dumpter, or out in the open will also attract rodents. Don’t let the mess of the current homeowners become your rat infestation. Cracks in foundation or windows/doors. 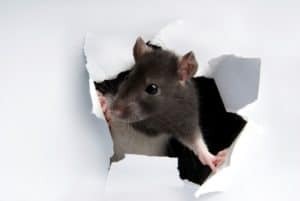 Any window or door that has been left open, or cracks and gaps in foundation or siding, may as well be a big “Welcome Home” sign to a rodent. These allow easy access for them without actually having to work for it. What happens if you love the house so much that you still want to buy it — infestation and all? If the brave soul in you decided to make the leap, even after you discovered what could be a full blown infestation, know that you are not up the creek without a paddle. There are things that can be done to rid your new home of mice or to prevent them from finding a way in. Seal up. A mouse can fit into a hole or gap an eighth of an inch wide. So, be sure to check the vents and soffits. Walk around the outside of the house and look for any holes big enough for an entrance point. Eliminate the attractants. Let’s face it, a mouse loves the idea of living in your home, no expenses paid, and who could blame them? Your house is just as cozy to them as it is to you. 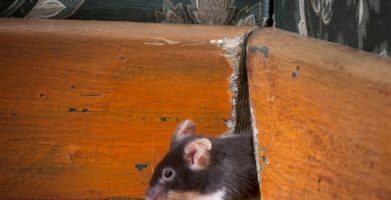 But, by getting rid of clutter, mess, and dirt, a rodents favorite things to hide in, you’ll be giving your home a little less curbside appeal — at least from a mouse’s perspective. A dusty and cluttered mess provides for an easy shelter to build nests and raise a family. Do not leave food out. Any food that is stored in a cardboard box or easily accessed bag like cereal, bread, oatmeal and crackers, should be kept in an air-tight container. Let’s not forget pet food — a favorite amongst the pest set — should also be kept in an air-tight tub so mice and rats will not smell it and try to make it their own. 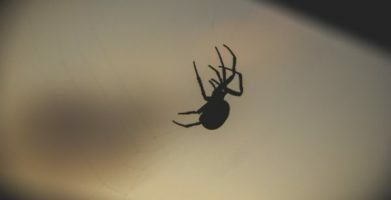 Don’t let the excitement of buying a new home be diminished by the nightmare of an infestation. I put my trust in botanical rodent repellent. The scent is too strong to a rodent’s sense of smell, but pleasant to ours, leaving our house smelling fresh and clean. I’ve heard many people say that the smell of Fresh Cab® is similar to the scent of a fresh cut Christmas tree. Although my family and I didn’t end up buying what I thought could have been my dream home, I never doubted that Fresh Cab® could have done the job. By putting your trust in EarthKind, you can check one more worry off of the list. I didn’t pack anything edible that mice are attracted to: cereals, baby snacks, etc… A mouse’s eyesight is very poor, therefore, the sense of smell and feel is very important for their survival. The sense of smell is the strongest of the five senses for mice, and they can smell through containers from a distance, they are like the shark of land. Cardboard boxes are pretty much the worst container to use if you don’t want mice to inhabit your things. They eat it, chew it, nest with it, and destroy it. Air-tight containers with thick plastic are the best option. Although mice can chew through thick plastic given enough time, they are more of a deterrent than cardboard. I placed 1 pouch of Fresh Cab® in every tub. Knowing that I packed our stuff in plastic, air-tight containers was enough to know that I would not find rodents in them, but protecting them with Fresh Cab sealed the deal. I also placed Fresh Cab pouches around the perimeter of the storage garage. This is always a good idea when you are storing things for any length of time, even if the area has not previously had a rodent problem. Mice are attracted to clutter and dirt, which is difficult to avoid in storage. I’m looking forward to taking a deep breath when I crack the lids our tubs and knowing I won’t be frightened by a sneaky mouse jumping out at me, almost as much as I’m looking forward to settling into our forever home! 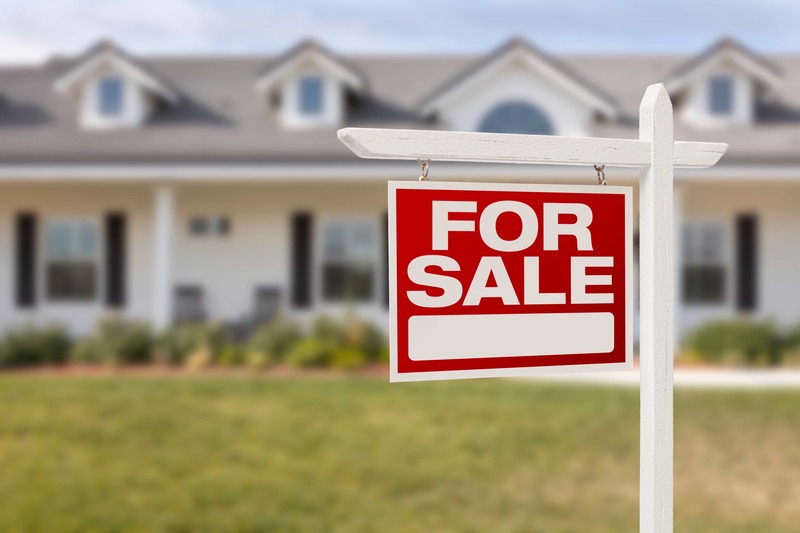 Moving into a new home can be an exciting time, but don't forget to investigate before making the plunge. Preventing pests is always on my mind when thinking about my surroundings. That came in handy when my husband and I were preparing to buy a new home. I had fallen in love with one house in particular--a beautiful, white and blue home built in '84. It had a gorgeous porch and very unique floor layout with four levels. I was sold from the moment I saw the picture online. Unfortunately, once we stepped inside, I realized I wasn’t alone in my admiration. As someone who can smell a mouse a mile away, I knew a colony of them had made it their home first. One of the first things I noticed was the smell of something foul, something that I know all too well--the smell of a dead mouse. The next thing that caught my attention was the little black droppings that appeared to be speckles in the carpet. If you walk into a house and the first thing that you can smell is a dead rat--be cautious! That usually means that there are numerous mice living, and dying, in the area and there is more than likely a rodent infestation. Food left out. Have you noticed any food that the current owner has left out? Rats and mice love a nice buffet of their favorites -- and surprisingly, cheese is not high on their list. The best treats for a mouse are pet food and grains, cereals, bread and crackers. And hey, those McDonald's bags are also a real delight. Mess left behind. 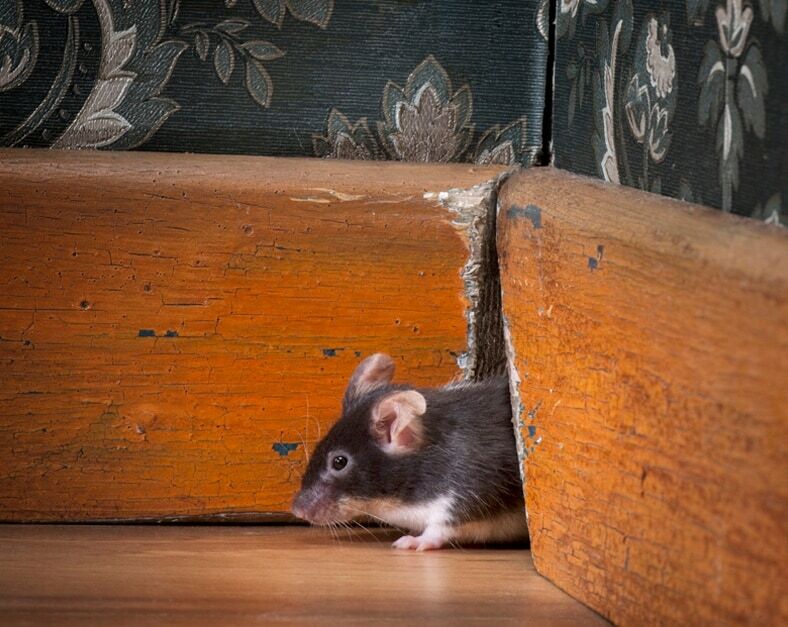 Rodents love clutter because it provides them with some great hiding places and all sorts of found treasures. Also, dust and dirt attract mice and rats, which just so happens to go hand in hand with clutter. Mice rely mostly on their sense of smell as their eye sight is poor, so leaving garbage in the can, dumpter, or out in the open will also attract rodents. Don't let the mess of the current homeowners become your rat infestation. What happens if you love the house so much that you still want to buy it -- infestation and all? Eliminate the attractants. Let's face it, a mouse loves the idea of living in your home, no expenses paid, and who could blame them? Your house is just as cozy to them as it is to you. 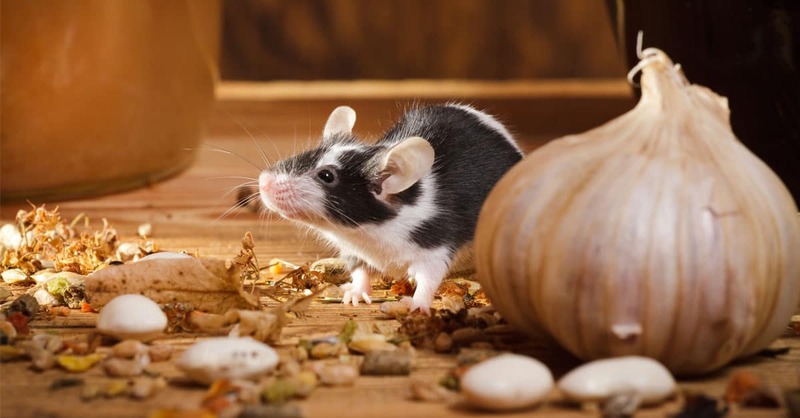 But, by getting rid of clutter, mess, and dirt, a rodents favorite things to hide in, you’ll be giving your home a little less curbside appeal  -- at least from a mouse’s perspective. A dusty and cluttered mess provides for an easy shelter to build nests and raise a family. Do not leave food out. Any food that is stored in a cardboard box or easily accessed bag like cereal, bread, oatmeal and crackers, should be kept in an air-tight container. Let's not forget pet food -- a favorite amongst the pest set -- should also be kept in an air-tight tub so mice and rats will not smell it and try to make it their own. Don't let the excitement of buying a new home be diminished by the nightmare of an infestation. I put my trust in botanical rodent repellent. The scent is too strong to a rodent's sense of smell, but pleasant to ours, leaving our house smelling fresh and clean. I’ve heard many people say that the smell of Fresh Cab® is similar to the scent of a fresh cut Christmas tree. Although my family and I didn't end up buying what I thought could have been my dream home, I never doubted that Fresh Cab® could have done the job. By putting your trust in EarthKind, you can check one more worry off of the list. I didn't pack anything edible that mice are attracted to:  cereals, baby snacks, etc...  A mouse’s eyesight is very poor, therefore, the sense of smell and feel is very important for their survival. The sense of smell is the strongest of the five senses for mice, and they can smell through containers from a distance, they are like the shark of land. Cardboard boxes are pretty much the worst container to use if you don't want mice to inhabit your things. They eat it, chew it, nest with it, and destroy it. Air-tight containers with thick plastic are the best option. Although mice can chew through thick plastic given enough time, they are more of a deterrent than cardboard. I placed 1 pouch of Fresh Cab® in every tub. Knowing that I packed our stuff in plastic, air-tight containers was enough to know that I would not find rodents in them, but protecting them with Fresh Cab sealed the deal. I also placed Fresh Cab pouches around the perimeter of the storage garage. This is always a good idea when you are storing things for any length of time, even if the area has not previously had a rodent problem. Mice are attracted to clutter and dirt, which is difficult to avoid in storage. I'm looking forward to taking a deep breath when I crack the lids our tubs and knowing I won't be frightened by a sneaky mouse jumping out at me, almost as much as I'm looking forward to settling into our forever home! string(59) "Mouse in Your New House? Find Out If Mice Lived There First"